Ten year-old Dhunu lives in a remote village in Assam, India, amidst raging deprivation. She is a free spirit, while her widowed mother struggles daily to put food on the table and raise her children. But this doesn't prevent her from having dreams, like owning a guitar for the tiny band she wants to put together with some local boys, the 'Village Rockstars'. Dhunu considers herself to be as capable as guys her age. When the boys eventually relinquish their dream, Dhunu refuses to give up on her ambition to own a guitar. 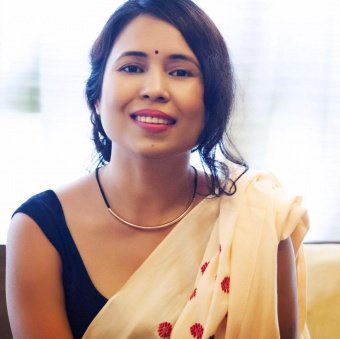 Rima Das is a self-taught screenwriter, producer and director. She was born and raised in a small village in Assam (Northeast India) and commutes between Mumbai and Assam. She manages a film company called Flying River Films which evaluates scripts and commissions projects. She wrote and directed the feature film Man with the Binoculars: Antardrishti (2016), a contender at the Tallinn Black Nights Film Festival and participant in the Indian Story section of the Jio MAMI Mumbai Film Festival. Village Rockstars, her second feature, premiered at the last Toronto Festival.